Cordova, AK – I had first met Points North owner Kevin Quinn at the L.A. ski show a decade ago, and we shared a ship to Antarctica in 2011 along with some of his guides and several of his customers where he helped my friend Liz and gave her a powder lesson one afternoon. So by references I was encouraged to try Points North myself. The final week of the season was the only one available when I inquired last March. Points North has been offering the last week of April to customers for just a few years after observing that conditions often remained good after they closed for the season. Unlike most of the lower 48 states, Alaska had enjoyed a banner snow year in 2011-12, but this year spring arrived in full force the week before mine. This resulted in unstable and/or rain-soaked snow at low elevation. Kevin felt we needed clear weather above 4,000 feet for good skiing and we did not get that for the first three days. Sunday and Monday were just cloudy but Tuesday was drizzly at PNH’s Orca Lodge, which is situated at sea level two miles outside Cordova. 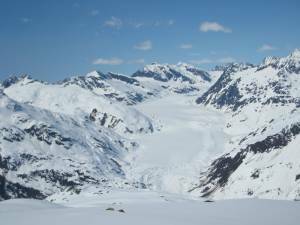 There is a local ski area — Eyak — which was closed but some people hiked it on one of the down days. Sea otters dotted the waters adjacent to Orca Lodge and I spent some time watching two bald eagles feeding on a deer carcass by the road between the lodge and town. Wednesday finally dawned clear and we finally got out in the second group to ski at about 10:30 a.m. PNH is the largest heli-ski operation in Alaska with thee A-Star helicopters usually serving four groups of four skiers each, although there were only three groups per heli on this last week of operation. The Orca Lodge is a 10- to 12-minute flight from most of the ski terrain so it takes an hour to get everyone out there. They had not flown for five days so we also had to take pause to assess conditions. About two inches of new snow graced the mountain, but it was dense and had bonded to the old snow so there was almost never a hard subsurface to be felt. Much of the time, intermediate pitches like our first run in Super Bowl skied almost like packed powder groomers. An occasional thin zipper crust did not impede skiing. Our safety drills were held on Sunday and guide Tom Walker inquired about our skiing ability. All of us were first timers at Points North. Michael and Julia had emigrated from Russia in the late 1980’s and now live in the San Francisco Bay Area, skiing mostly at Squaw. Tom and Jeannine were from a rural area in southeast Idaho and had not skied all season due to lack of snow at their local ski area, Pebble Creek. Guide Tom said later that this gave him some concerns, but Idaho Tom had ski bummed for 150 days a year when he was in college in Utah and also has a racing background. Jeannine skied well enough but she tired easily and went in after seven runs when the heli had to refuel. If we had a full week Jeannine was scheduled to ski one day and Tom the rest, but after three down days PNH took them both out on Wednesday. The remaining four of us turned out to be quite compatible in both how and what we could ski. Since the new snow had improved the skiing PNH aimed mostly for sheltered north-facing terrain, looking for powder. Our second and third runs were mostly successful in this regard. We stopped for lunch after the third run while the heli refueled, moving thereafter westward into the Targhetto area, which drains into the Cordova Glacier. These runs had short steep sections near the top at elevations of 4,500 to 5,000 feet that usually sported soft chalky snow, followed by some powder in the middle and smooth packed powder lower down. Below 3,000 feet the snow softened in the spring sun, and with only an inch or so over a consolidated space it was already in full-on corn mode. Our guide Tom dug a few inches down through the packed powder during lunch and showed us that the snow beneath was granular corn from the previous week. He tried to get us onto some steep terrain after Jeannine flew out, but the pilot made three passes but was turned away by some wind on the ridgeline. We ended up atop a flat saddle sheltered from the wind. We got a good look at the Hidden Couloir that Tom had been trying to reach as we descended. There was a bergschrund to avoid at the bottom of the couloir, then what looked like good powder on the apron below. We later learned that one of the other groups got in there during a lull in the wind. To looker’s left of Hidden Couloir was Fruit Bowl, wide at the top before funneling in to the right of some glacial ice. Below Fruit Bowl were buried crevasses and Tom did not think it was safe to ski there in late season when the snow bridges are likely weaker. Our last run had good consistent pitch and snow for more than 2,000 vertical feet, wrapping up the day with 18,100 vertical feet by 5:30 p.m.
We awoke to clear skies on Thursday also, but remote stations were reporting winds exceeding 30 m.p.h., unacceptable for helicopter landings. They fortunately abated after noon when the first groups ventured out. We were in the last group and didn’t leave the lodge until 1 p.m., which from a snow conditions perspective turned out to be for the best. It was logical to start Thursday near where we left off on Wednesday, but a bit farther up the Cordova Glacier. The high winds overnight, however, had left some slab and sastrugi in their wake. There was a bergschrund below us, so Tom traversed over to where he wanted us to start skiing. The snow was a bit slabby, and also thanks to being the first run of the day I skied very defensively. We regrouped on a bench in the middle of the run. A steep, sheltered pitch looked at the bottom, no doubt a prime area in powder, but in spring it was low enough that the sun had softened it to the point that big sluffs were possible, and Tom and Michael each set off a few at skier’s left. Per Tom’s recommendation I went skier’s right and found the sluffing more manageable. Points North requires that customers bring a 20-channel Motorola radio. 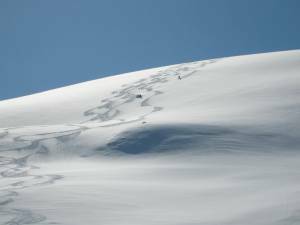 Each ski group is on its own channel and the guide can ski over steep rollovers out of sight and radio instructions back to the group about snow conditions, hazards and more, as in this example. I have not seen the use of radios for customers at the many other snowcat and heliskiing operators I have visited, but they enable more precise instructions from guides and can therefore enhance safety. The wind slacked off completely by 2 p.m. and temperatures skyrocketed, so the previous day’s strategy to seek out sheltered powder was not going to work. Instead, the helicopters relocated northeast to seek sun-softened corn. We first landed at a bit over 4,000 feet on top of a moderately steep west-facing pitch, which guide Tom first tested and found to be crusty. We waited, ate lunch and then slipped down the ridgeline to a more southwesterly aspect that had softened to corn. The valley moderated to intermediate pitch but with the same excellent corn aspect down to about 1,500 feet, although the last 500 vertical to the pickup was gloppy. Our third drop resulted in a slabby sideslip down a longer western face. Tom decided to traverse around to a direct south line into Rollie’s, which would deliver perfect corn for the remainder of the afternoon. We had a short break on our fifth drop and saw the heli landing another group on the next peak south of us, with a panoramic background stretching to Cordova’s inlet. The snow on the short, steep descent from that drop was again slabby, but 2,000 vertical of perfect corn waited below it. We thus took a sixth drop that fed into the same area. It was now 5:30 p.m. and Tom thought that we might have a shot at JJ’s, a long steep pitch bathed in the afternoon sun. The landing took place on a tight ridge with a precipitous drop off the back. PNH likes to have a set routine for loading and unloading the helicopter. My role as first out and last in was to hold the door open while Tom unloaded the skis and packs. With the heli’s skids on the ridge and nose overhanging the precipice I asked, “Where do I hold the door?” I was relieved to hear that we would all get out with Tom holding the door and he would then unload the gear. Tom first shoveled out a flat landing in case he found that the snowpack was unsafe to ski and we would have to be picked up where we were. 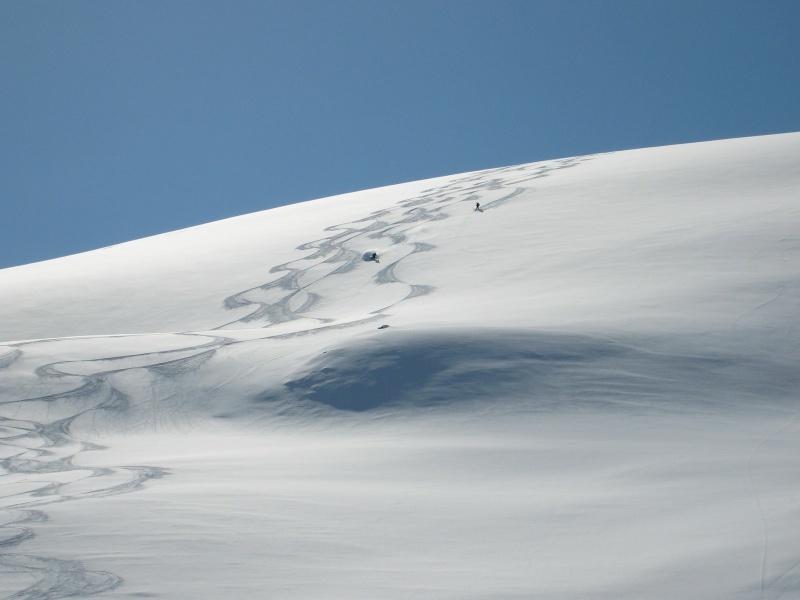 He traversed out a bit before dropping in, skiing the steep upper part before radioing for us to follow one at a time. The steepest upper quarter was marked by smooth snow, sluffed a little but great skiing. The second quarter had a more irregular surface which Tom had smoothed out some if you could stay in his line. Shortly after I passed him I saw that a fan of smooth corn had started just to my left, so I moved over there and the rest of the descent was nearly effortless. Per radio instruction I skied down to the flats, a total of 1,900 vertical feet. The others came down one at a time according to the safety protocol in steep terrain. The lower half mellowed out and drained to the same low point as our second run for a total of 3,800 vertical feet. As before, only the bottom 500 feet along a mellow glacier descent was mushy. On our last run of the day some of the steep Chugach flutes we’ve all seen in ski movies loomed above our landing zone. We went the other way in windbuff at the top, which transitioned into a somewhat resistant zipper crust, but with a gentle pitch it was manageable with gradual turns. It eventually turned south-facing where Tom took some final pictures of us cruising the corn. We finished skiing at 7 p.m. after eight runs and 21,900 vertical feet. Sunset at this time of year occurs in Cordova at around 9:30 p.m., but in March and April Alaska sunsets advance by five to seven minutes per day. The weather clouded over again, so we did not ski Friday. Points North granted a credit of half an hour heli time on a subsequent visit. 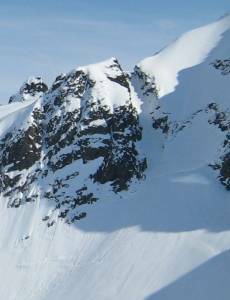 With an all-inclusive price of $5,275 for six ski days in 2011-12, Points North is the best value of any of the major Alaska heli operators. Dean Cummings’ H2O Guides in Valdez charges about $2,000 more. 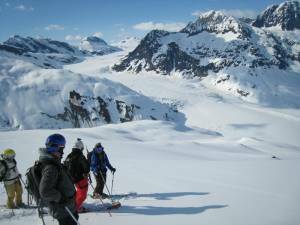 Chugach Powder Guides is $5,600 for a five-day ski package and does not include meals, but the cost of skiing comparisons are more complex. 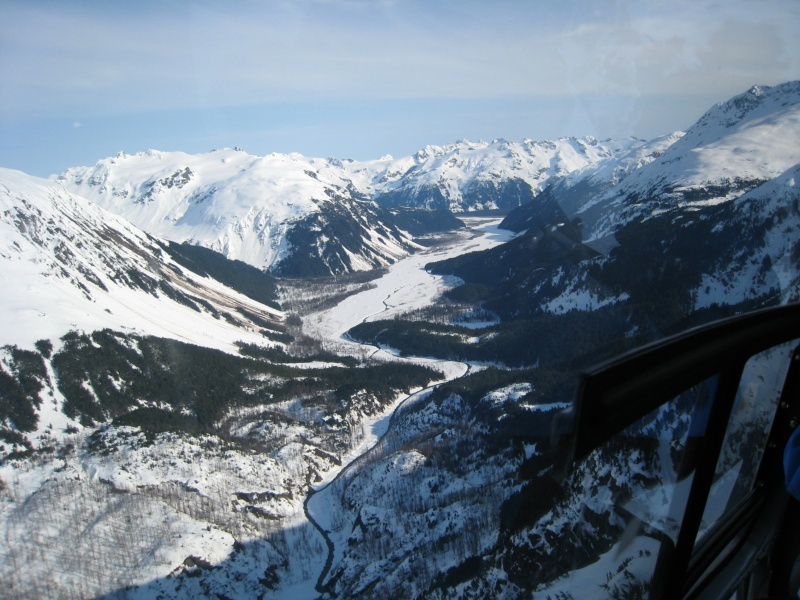 CPG guarantees 60,000 vertical feet, H2O guarantees 30 runs and Points North guarantees four hours of heli time. By my observation 10 runs a day is somewhat typical, and three fly days out of six is probably also typical. On my visit I got three hours of heli time in two days, so three normal days at Points North would probably have an extra half hour of heli time to add another $450 to the cost. H20 charges $175 for extra runs beyond the guaranteed 30 and Points North’s surcharge works out to $125 to $150 per run. I’ve enjoyed three days with Chugach Powder Guides in 2007 and 2010 and I had lengthy conversations with a couple of guys who skied both H2O and Points North in 2012. They had been luckier with both weather and snow conditions at H2O, but we all knew we were taking some chances with snow conditions during the last week of April. One thing I do know from both their comments and my huge powder day at CPG in 2007 is that when the snow conditions are good you will be doing very long runs averaging over 3,000 vertical feet, so if you get three good days at Chugach Powder Guides you will overrun their vertical guarantee by quite a bit and be paying as much as $1,000 more. You might think Points North’s charge by heli time would be vertical sensitive, but it’s really driven more by run count. Our second eight-run day with 21,900 vertical feet used less heli time than our first 10-run day of 18,100 vertical feet. Quinn’s current permit area for Points North is situated on Alaska state land but starting this season he expects to have permits for a considerable amount of adjoining U.S. Forest Service land as well. Some of this is closer to his base, some of it is higher in altitude (good for weeks like mine) and the overall expansion should give Points North more weather flexibility comparable to H2O and Chugach Powder Guides. 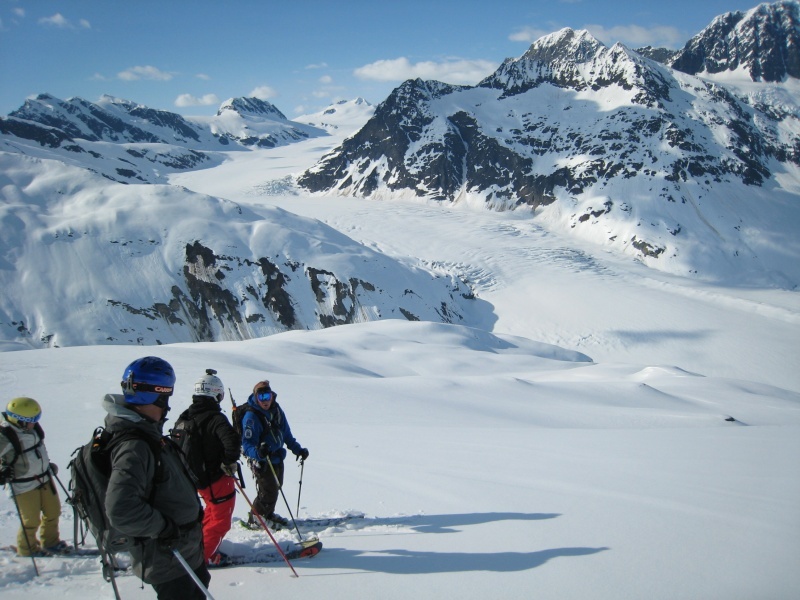 Despite our terrain choices, Points North’s terrain overall is steeper than what you will typically find in Canada’s alpine heli areas and you will get to ski steep terrain more often due to the more stable maritime snowpack in Alaska. At current exchange rates heliskiing is also considerably more expensive in Canada than it is in the 49th state. I expect to return to Points North in the future as I was very impressed by both the terrain and the level of service.